It has often been suggested that whatever is said about India, the opposite may also be true. If there is one area where this paradox applies, it is in India’s monsoon behaviour, which directly impacts our agricultural growth story year after year. Thus, even as the India Meteorological Department (IMD) predicted a “normal” monsoon this year, Bihar and parts of Gujarat saw huge floods and many states faced deficient rainfall. And even as the IMD is still to withdraw its last forecast of “normal” rainfall (meaning, a total precipitation all over India of plus or minus 10% of the long period average), latest ground reports suggest that nearly 60% of our land area received deficient rainfall, and around 225 districts may be in the grip of moderate-to-acute drought conditions. Worse, the deficiency is said to be pronounced in the food-bowl states of north-west and central India — including Punjab, Haryana, western Uttar Pradesh and Madhya Pradesh, apart from some agriculturally-proficient regions of Maharashtra and Karnataka. The first conclusion we need to draw from this is that aggregates lie. The IMD simply needs to get its spatial forecasts of rainfall better if we are to be better prepared for future droughts and floods. The second conclusion is that there is no reason for panic. Droughts do not have the same impact on overall agricultural production as they used to have earlier, since many parts of the food bowl are well irrigated. Madhya Pradesh, the new star performer in agricultural production, for example, saw a 35% improvement in its irrigation potential in the 10 years between 2004-05 and 2013-14. Another less-known aspect is power. When power supplies are assured, farmers can easily tap groundwater during poor monsoon years. This was one reason (apart from the availability of Narmada waters) behind Narendra Modi’s Gujarat agricultural miracle of the last decade. In short, droughts and floods do not cause major blips in agricultural output, and even less on overall GDP, since agriculture is barely 15% the overall economy. In the two back-to-back drought years of 2014-15 and 2015-16, overall agricultural growth was anaemic, but positive. Buffer stocks ensured that there was no unusual spike in foodgrain prices. This brings us to the third — and critical conclusion. The real tragedy is embedded in the millions of small and marginal farmers who are minor data points in the overall aggregate figure of agricultural growth or stagnation. Aggregates hide the deeper bruises in Indian agriculture. Consider how we have become inured to this cycle of floods and droughts repeating themselves year after year. We get worked up only when the prices of specific commodities – a tur dal one year, or potatoes and tomatoes in another – shoot to the sky. Otherwise, the rigmarole that repeats itself in the background every year hides the problems agriculture faces. When confronted with floods or droughts, states start making exaggerated claims of losses, which is followed by central teams visiting the affected areas to assess the damage. After this assessment, final payments are made that are far below what states may have demanded or what may be needed to alleviate genuine farm distress. A few months later, a cry will go up about rising farm distress and suicides, as much of the relief ends up with middlemen, and demands will be made seeking waivers of farm loans. These are conveniently timed before the next round of state or central elections. This rigmarole needs to stop. This year, loan waivers already announced have added up to over Rs 1.25 lakh crore; if all states follow suit, the total waivers will run upwards of Rs 2.7 lakh crore, as the Economic Survey noted. This will not only be destructive of credit discipline, but also make banks wary of lending more to agriculture in future. Every farm loan waiver in the past has led to an immediate deceleration in farm credit. What both states and centre have forgotten to ask themselves is this simple question: if we are willing to spend lakhs of crores in loan waivers and we still find indebted farmers consuming pesticide by the thousand in many states, wouldn’t it be cheaper to ensure a sensible and quick-disbursing compensation package for losses due to natural disasters or crop failures or any kind? Would it not make sense to offer compulsory and ultra-cheap insurance to every farmer, so that natural calamities do not ruin livelihoods by allowing debt burdens to accumulate to levels that cannot be services by farm incomes? 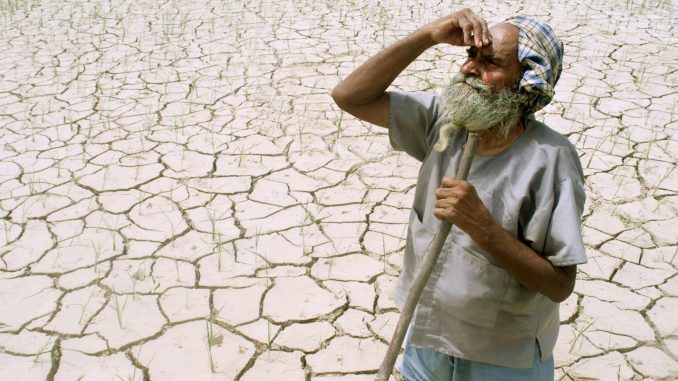 India’s agricultural problem is not about the lack of resources; it is about a lack of vision. The imperatives are the following: we need to get people out of agriculture by enabling job creation outside agriculture; this will enhance productivity as farm sizes become more viable through consolidation and mechanisation; the state needs to simultaneously invest in irrigation, cold chains, and cheap insurance, all of which yield better outcomes than loan waivers. Technology (satellite-based assessments of crop damage, for example) can be used to cut out the role of the middleman, both in compensating for crop losses, and in determining mandi prices. Once inter-state curbs on farm produce go, and once farmers are able to sell their products before they cart their products to mandis, no one needs to fear a loss due to plentiful arrivals at mandis at the wrong time. Floods and droughts are not the problem; the problem is our inability to see the damage it does to farmers whose distress gets blotted out by the macro statistics on agricultural growth.